This topic provides a walkthrough of an enterprise-scale build and deployment process. The approach described in this topic uses custom Microsoft Build Engine (MSBuild) project files to provide fine-grained control over every aspect of the process. Within the project files, custom MSBuild targets are used to run deployment utilities like the Internet Information Services (IIS) Web Deployment Tool (MSDeploy.exe) and the database deployment utility VSDBCMD.exe. 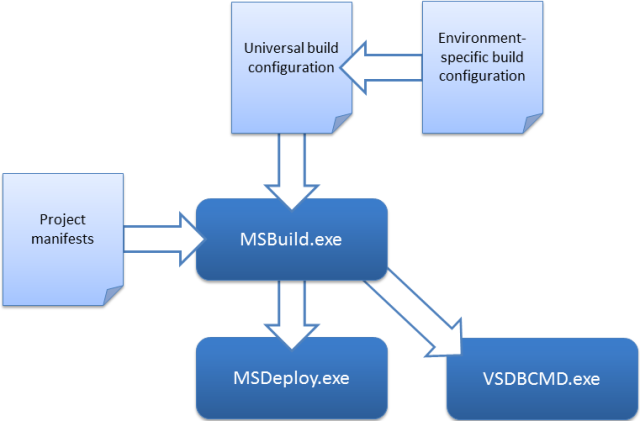 The previous topic, Understanding the Project File, described the key components of an MSBuild project file and introduced the concept of split project files to support deployment to multiple target environments. If you're not already familiar with these concepts, you should review Understanding the Project File before you work through this topic. The deployment method at the heart of these tutorials is based on the split project file approach described in Understanding the Project File, in which the build process is controlled by two project files—one containing build instructions that apply to every destination environment, and one containing environment-specific build and deployment settings. At build time, the environment-specific project file is merged into the environment-agnostic project file to form a complete set of build instructions. A universal project file (Publish.proj). This contains build and deployment instructions that do not change between destination environments. An environment-specific project file (Env-Dev.proj). This contains build and deployment settings that are specific to a particular destination environment. For example, you could use the Env-Dev.proj file to provide settings for a developer or test environment and create an alternative file named Env-Stage.proj to provide settings for a staging environment. A command file (Publish-Dev.cmd). This contains an MSBuild.exe command that specifies which project files you want to execute. You can create a command file for every destination environment, where each file contains an MSBuild.exe command that specifies a different environment-specific project file. This lets the developer deploy to different environments simply by running the appropriate command file. In the sample solution, you can find these three files in the Publish solution folder. The first thing that happens is that the two project files—one containing universal build and deployment instructions, and one containing environment-specific settings—are merged into a single project file. MSBuild then works through the instructions in the project file. It builds each of the projects in the solution, using the project file for each project. It then calls out to other tools, like Web Deploy (MSDeploy.exe) and the VSDBCMD utility to deploy your web content and databases to the target environment. It deletes the contents of the output directory, in preparation for a fresh build. For web projects—in this case, an ASP.NET MVC web application and a WCF web service—the build process creates a web deployment package for each project. For database projects, the build process creates a deployment manifest (.deploymanifest file) for each project. It uses the VSDBCMD.exe utility to deploy each database project in the solution, using various properties from the project files—a target connection string and a database name—together with the .deploymanifest file. It uses the MSDeploy.exe utility to deploy each web project in the solution, using various properties from the project files to control the deployment process. You can use the sample solution to trace this process in more detail. To deploy the Contact Manager solution to a developer test environment, the developer runs the Publish-Dev.cmd command file. This invokes MSBuild.exe, specifying Publish.proj as the project file to execute and Env-Dev.proj as a parameter value. The /fl switch (short for /fileLogger) logs the build output to a file named msbuild.log in the current directory. For more information, see the MSBuild Command Line Reference. At this point, MSBuild starts running, loads the Publish.proj file, and starts processing the instructions within it. The first instruction tells MSBuild to import the project file that the TargetEnvPropsFile parameter specifies. The TargetEnvPropsFile parameter specifies the Env-Dev.proj file, so MSBuild merges the contents of the Env-Dev.proj file into the Publish.proj file. The next elements that MSBuild encounters in the merged project file are property groups. Properties are processed in the order in which they appear in the file. MSBuild creates a key-value pair for each property, providing that any specified conditions are met. Properties defined later in the file will overwrite any properties with the same name defined earlier in the file. For example, consider the OutputRoot properties. When MSBuild processes the first OutputRoot element, providing a similarly named parameter has not been provided, it sets the value of the OutputRoot property to ..\Publish\Out. When it encounters the second OutputRoot element, if the condition evaluates to true, it will overwrite the value of the OutputRoot property with the value of the OutDir parameter. The next element that MSBuild encounters is a single item group, containing an item named ProjectsToBuild. MSBuild processes this instruction by building an item list named ProjectsToBuild. In this case, the item list contains a single value—the path and filename of the solution file. At this point, the remaining elements are targets. Targets are processed differently from properties and items—essentially, targets are not processed unless they are either explicitly specified by the user or invoked by another construct within the project file. Recall that the opening Project tag includes a DefaultTargets attribute. This instructs MSBuild to invoke the FullPublish target, if targets are not specified when MSBuild.exe is invoked. The FullPublish target doesn't contain any tasks; instead it simply specifies a list of dependencies. It must invoke the Clean target. It must invoke the BuildProjects target. It must invoke the GatherPackagesForPublishing target. It must invoke the PublishDbPackages target. It must invoke the PublishWebPackages target. The Clean target basically deletes the output directory and all its contents, as preparation for a fresh build. Notice that the target includes an ItemGroup element. When you define properties or items within a Target element, you're creating dynamic properties and items. In other words, the properties or items aren't processed until the target is executed. The output directory might not exist or contain any files until the build process begins, so you can't build the _FilesToDelete list as a static item; you have to wait until execution is underway. As such, you build the list as a dynamic item within the target. In this case, because the Clean target is the first to be executed, there's no real need to use a dynamic item group. However, it's good practice to use dynamic properties and items in this type of scenario, as you might want to execute targets in a different order at some point. You should also aim to avoid declaring items that will never be used. If you have items that will only be used by a specific target, consider placing them inside the target to remove any unnecessary overhead on the build process. Build a list of files to delete. The BuildProjects target basically builds all the projects in the sample solution. The DeployOnBuild property instructs MSBuild to run any deployment instructions in the project settings when the build of each project is complete. The DeployTarget property identifies the target that you want to invoke after the project is built. In this case, the Package target builds the project output into a deployable web package. The Package target invokes the Web Publishing Pipeline (WPP), which provides integration between MSBuild and Web Deploy. If you want to take a look at the built-in targets that the WPP provides, review the Microsoft.Web.Publishing.targets file in the %PROGRAMFILES(x86)%\MSBuild\Microsoft\VisualStudio\v10.0\Web folder. If you study the GatherPackagesForPublishing target, you'll notice that it doesn't actually contain any tasks. Instead, it contains a single item group that defines three dynamic items. These items refer to the deployment packages that were created when the BuildProjects target was executed. You couldn't define these items statically in the project file, because the files to which the items refer don't exist until the BuildProjects target is executed. Instead, the items must be defined dynamically within a target that is not invoked until after the BuildProjects target is executed. The items are not used within this target—this target simply builds the items and the metadata associated with each item value. 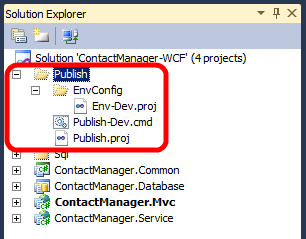 Once these elements are processed, the PublishPackages item will contain two values, the path to the ContactManager.Mvc.deploy.cmd file and the path to the ContactManager.Service.deploy.cmd file. Web Deploy creates these files as part of the web package for each project, and these are the files that you must invoke on the destination server in order to deploy the packages. If you open up one of these files, you'll basically see an MSDeploy.exe command with various build-specific parameter values. The DbPublishPackages item will contain a single value, the path to the ContactManager.Database.deploymanifest file. A .deploymanifest file is generated when you build a database project, and it uses the same schema as an MSBuild project file. It contains all the information required to deploy a database, including the location of the database schema (.dbschema) and details of any pre-deployment and post-deployment scripts. For more information, see An Overview of Database Build and Deployment. You'll learn more about how deployment packages and database deployment manifests are created and used in Building and Packaging Web Application Projects and Deploying Database Projects. Briefly speaking, the PublishDbPackages target invokes the VSDBCMD utility to deploy the ContactManager database to a target environment. Configuring database deployment involves lots of decisions and nuances, and you'll learn more about this in Deploying Database Projects and Customizing Database Deployments for Multiple Environments. In this topic, we'll focus on how this target actually functions. First, notice that the opening tag includes an Outputs attribute. Split the items in DbPublishPackages into batches of items that contain the same Identity metadata value. Execute the target once per batch. Identity is one of the built-in metadata values that is assigned to every item on creation. It refers to the value of the Include attribute in the Item element—in other words, the path and filename of the item. In this case, because there should never be more than one item with the same path and filename, we're essentially working with batch sizes of one. The target is executed once for every database package. You can see a similar notation in the _Cmd property, which builds a VSDBCMD command with the appropriate switches. In this case, %(DbPublishPackages.DatabaseConnectionString), %(DbPublishPackages.TargetDatabase), and %(DbPublishPackages.FullPath) all refer to metadata values of the DbPublishPackages item collection. The _Cmd property is used by the Exec task, which invokes the command. As a result of this notation, the Exec task will create batches based on unique combinations of the DatabaseConnectionString, TargetDatabase, and FullPath metadata values, and the task will execute once for each batch. This is an example of task batching. However, because the target-level batching has already divided our item collection into single-item batches, the Exec task will run once and only once for each iteration of the target. In other words, this task invokes the VSDBCMD utility once for each database package in the solution. For more information on target and task batching, see MSBuild Batching, Item Metadata in Target Batching, and Item Metadata in Task Batching. It manipulates the SetParameters.xml file for each package to include the correct details for the target environment, using the XmlPoke task. It invokes the deploy.cmd file for each package, using the appropriate switches. Just like the PublishDbPackages target, the PublishWebPackages target uses target batching to ensure that the target is executed once for each web package. Within the target, the Exec task is used to run the deploy.cmd file for each web package. For more information on configuring the deployment of web packages, see Building and Packaging Web Application Projects. This topic provided a walkthrough of how split project files are used to control the build and deployment process from start to finish for the Contact Manager sample solution. Using this approach lets you run complex, enterprise-scale deployments in a single, repeatable step, simply by running an environment-specific command file.